It’s been another busy week, but learning a lot more what CarbOthello pencils can do. I really like the medium although I have a lot to learn about making color blends. This past week had our usual gesture drawings, 2 hand drawings in pastel, and then a costumed figure drawing. Sanded paper like UArt or Wallis can receive more layers than Canson Mi-Teintes or other pastel papers, but they will eat up your pencils quicker. I found I like the soft rich blacks of Nitram charcoal. It also doesn’t have as much dust as General’s. 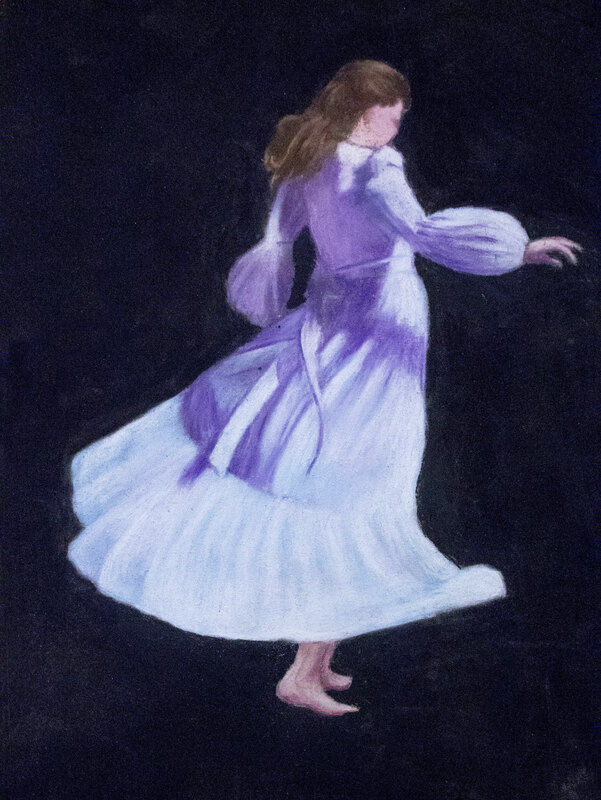 I’ll also post the three examples of pastel paintings that I posted in this week’s discussion. Pastel offers such a wide variety of expression. I really like the medium. The first is a rendering of Ophelia from Cuong Nguyen who worked as a successful web designer for many years until he got working more as a street chalk artist, then became a full-time fine art painter. I learned from him that skin tones can be mixed with a green underpainting (verdaccio) and flesh tones. 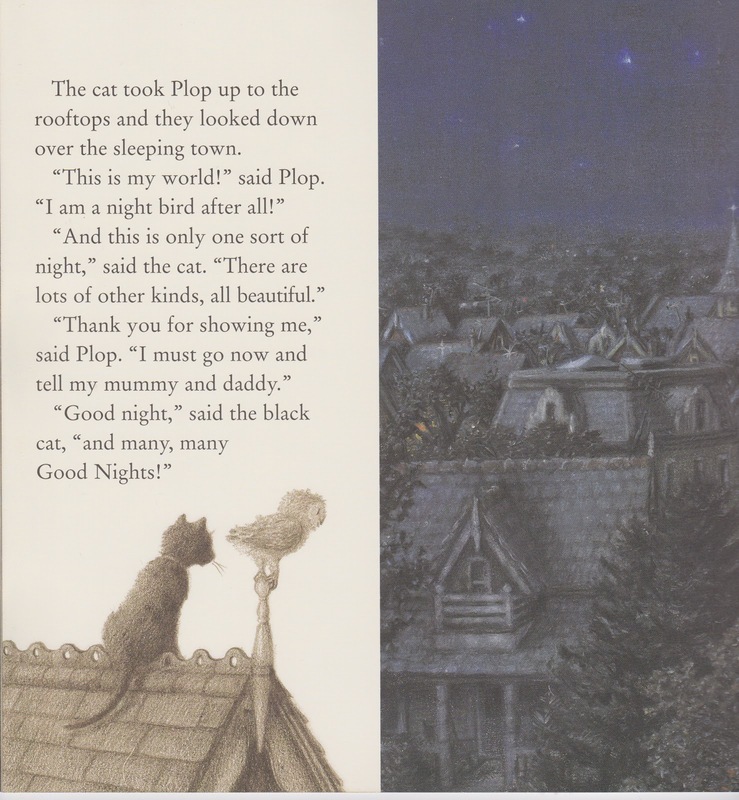 The second is an illustration from Paul Howard from a Jill Tomlinson book called The Owl who was afraid of the dark. I like the soft luminous quality Howard was able to get from his use of pastels. Finally, there’s The Guardian by Fiona Tang. 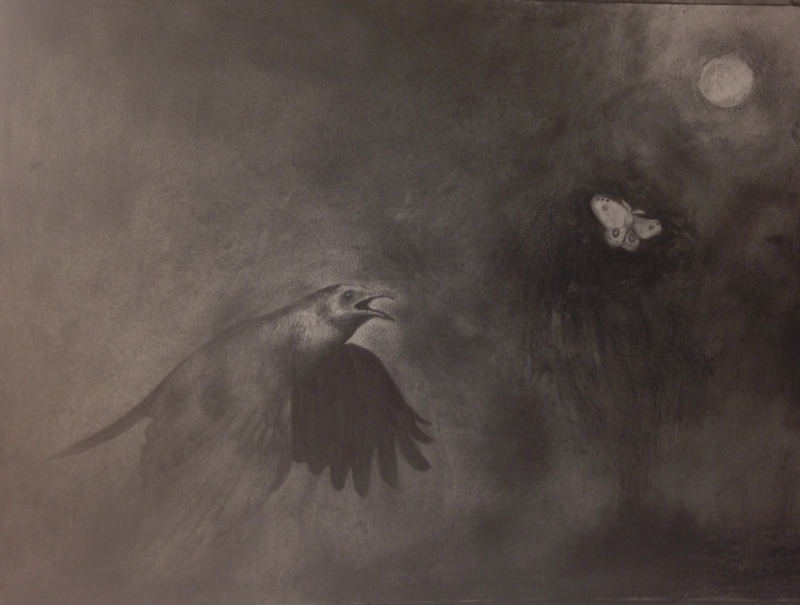 It combines chalk pastel with charcoal and acrylic on a paper backing. 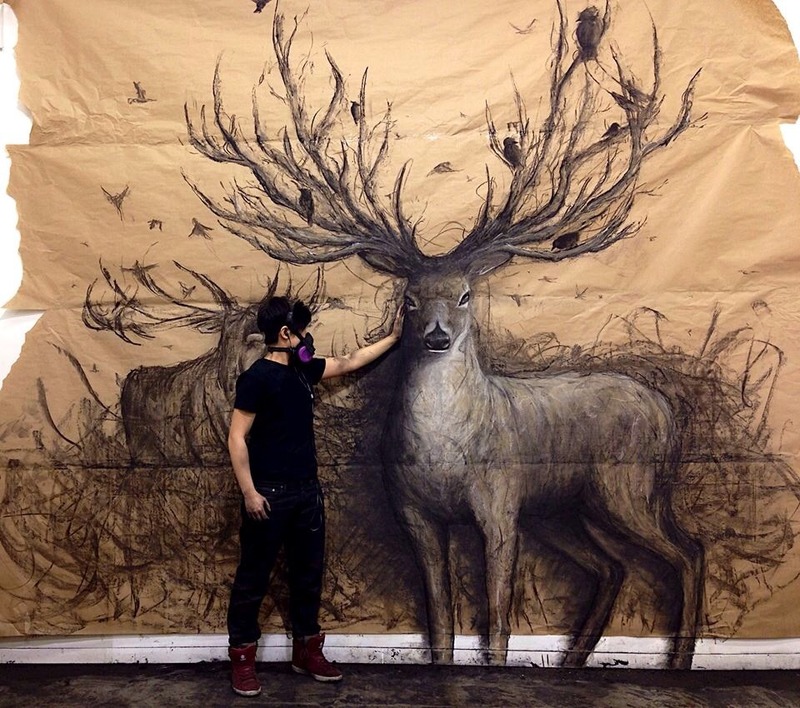 The different textures of the various media used for this piece this piece contribute to the overall effect in different ways; the chalk pastel in particular is important to the trompe l’oeil effect, helping to differentiate the “three-dimensional” stag in the front from the more “two-dimensional” background charcoal elements, with the white tone of the pastel “light” against the natural brown color of the paper. This coming week is my final one for Life Drawing IV. We’ve got a watercolor assignment, the first I’ve had since I’ve been in art school. Also this weekend, I’ll be going to the Great Critique-nic through the Western Washington Society of Children’s Books Writers and Illustrators. It’ll be the first one that I’ve ever gone to. People bring their illustrations or writing and split up into small groups where they critique and be critiqued. I’m looking forward to sculpting this tomorrow – we’re supposed to take a myth and create a container based on it. 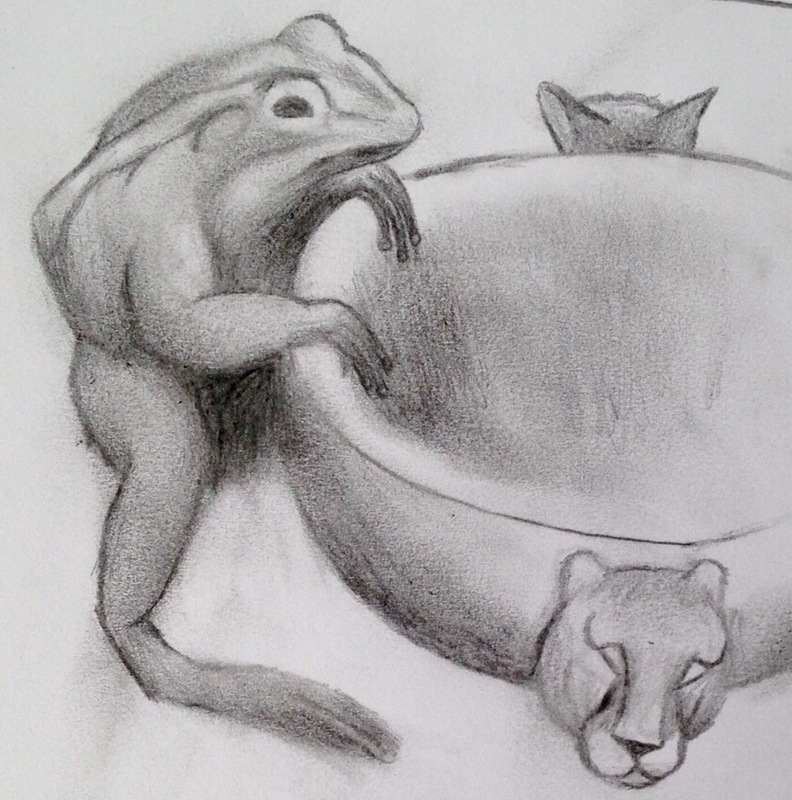 This was my favorite idea for the Tibetan story of the Frog King. The Frog King outwits both a fox and a tiger. My mythic object will be strands from the tails of a tiger and a fox when they got them tied together in a knot.